HTIG operates international freight forwarding services, storage and distribution, import and export trading, product sales and agency, information technology services, sales of electrical machinery and chemical products, etc.HTIG holds the First-class qualification of international freight forwarding and international trade agency, constructed the first large modern logistics park in Henan which integrates office work, storage, delivery, stockpiling, disassembling, distribution and packaging. 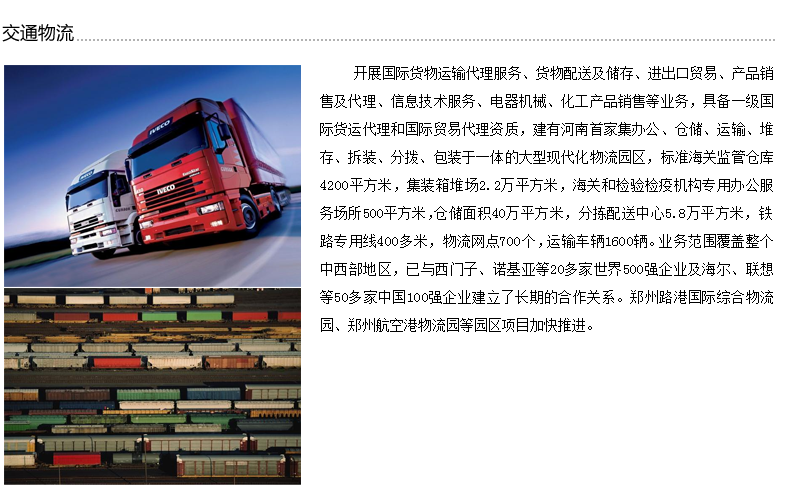 The logistics park has 4,200㎡of Customs Bonded Warehouse, 220,000㎡ of container yards, 500㎡ of workplace of customs and inspection & quarantinecenter, 400,000㎡ of storage warehouse, 58,000㎡ of sorting and dispatching center, 400-meter of special railway, 700 delivery offices and 1600 delivery vehicles. The scope of business covers the entire central and western regions of China; we have built long-term cooperative relationships with more than 20 enterprises (such as Siemens and Nokia)of the Globe Fortune 500 enterprises and more than 50 enterprises (such as Haier and Lenovo) of top 100 Chinese enterprises. The projects of Zhengzhou Highway Port International Integrated Logistics Park and Zhengzhou Airport Logistics Park are accelerating.